Sometimes pregnancy can come as a surprise. Sometimes it is something you have been trying for, and when it actually happens, it is shocking! Whatever your personal reaction to your pregnancy, allow yourself the time you need to adjust to your new reality. There is a brand new little human being in your life now—that is pretty huge. If he has been eagerly anticipating becoming a father, perhaps you may want to do something a little special. This can take many forms and it can be fun to get creative. You’re only going to break this news about this baby to Dad one time, so go ahead and have fun with it! Cakes, a special dinner, balloons, scavenger hunts, or a special card are all tried and true ways to let Dad in on the news! Gather the supplies or materials you may need, and be sure nothing comes up last minute that will distract Dad from this big news! If you are not sure how enthusiastic or supportive the father will be, you may want to take some extra time to plan out how, when, and where you will share the news with him. Perhaps you feel like you’ll need some support of your own before you share the news with the father. It is OK to tell your close friends or family members and ask for their support. If you feel more comfortable having a friend or family member with you when you share the news with the father, check his or her availability before deciding when you’re going to share your news with Dad. You may want to give Dad some time to mentally prepare for some big news. You can do this by letting him know there is something you want to talk to him about and then confirming when and where this discussion will happen. It may be “when you get home from work today” or “Can we meet tomorrow at the coffee shop on Main Street?” Decide what you are most comfortable with. This is important news that will require open and honest communication. Using text or email is probably not the most appropriate way to share this news with him. Even if there are special circumstances, like the father being out of the country for a long work trip or a deployment, you can use a face-to-face video chat like FaceTime, Skype, or Google Hangouts. That way, you can see each other and each other’s faces—which helps to cut down on miscommunication and misunderstanding. Let him see your enthusiasm and determination! When it is time to share the news, it is OK if you feel a little nervous. Maybe you feel both nervous and excited. That’s all right. This is a big deal! Take a deep breath and be honest and open. If you have planned something fun to make it a surprise, communicate your enthusiasm and excitement. Your excitement will be contagious. If you are unsure how he may react, use direct statements that clearly communicate the reality you are facing: “I asked to talk to you because I have some important news to tell you. I am pregnant. We are going to have a baby…” and then tell him when your estimated due date is or the approximate month you believe you are due. If it seems that the father has trouble understanding (sometimes dads get a little overwhelmed at this news! ), you can follow up with, “Your son or daughter will be born in a little less than nine months.” Communicate to him that he is the father, not that he is going to be a father (because he already is), and you are going to need him to take responsibility for this baby and to support you now, not later. You may need to give him some time to absorb this news, just like you may have had to when you learned you were pregnant! Again, give him some time to absorb the news. If he isn’t prepared to do that, you may want to tell him (as calmly as possible), “I want you to know that I am prepared to care for our baby and I have friends and family who will help us.” At this point, he may need to absorb the news and then regroup in a day or so. When you continue your discussion, don’t feel like you have to have everything planned for the future. It is OK to continue the discussion over the coming months as you and he determine how he plans to support you and the baby. Biological dads, at the very least, have a responsibility to pay child support, and if you need help getting that set up, there are social service agencies that will help you. If he is unsupportive and you want to explore adoption options, help is here. Perhaps there may be a threat of or history of violent or abusive behavior from the baby’s father. If this is the case, do not share the news with him alone. Have a counselor, social worker, or advocate with you. He or she can help you set appropriate boundaries with the father to keep both you and your baby safe. Chances are, he will be a little surprised (perhaps like you were), but then become enthusiastic about having a baby. It can seem both daunting and almost unreal to many dads. He will need you to communicate to him what your needs are and what you need and expect from him. Men aren’t mind readers, and when it comes to pregnancy, they tend to be less intuitive about how to support you—but it doesn’t mean they don’t want to! 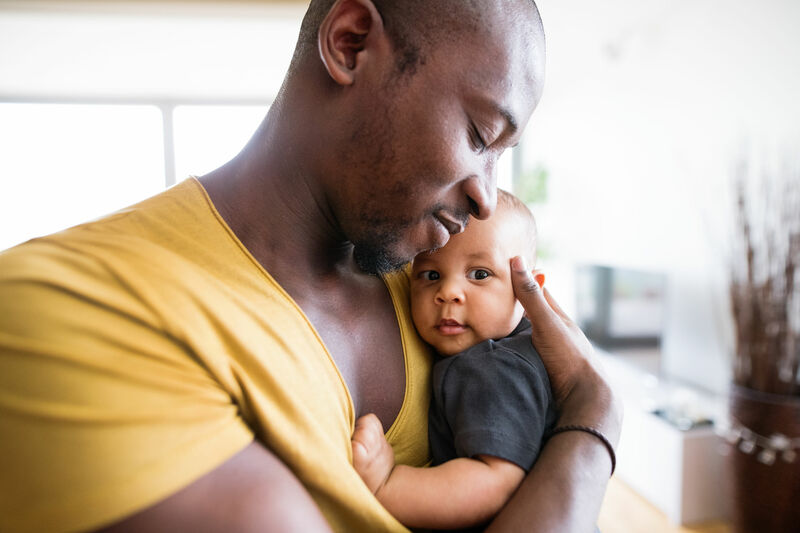 If the father is not supportive or refuses to be a part of you and your baby’s life, surround yourself with people who WILL support you: friends, family, co-workers, advocates, and caregivers, including organizations in the community. Allow them to love and support you and your baby. You deserve it! Encourage the father of your child to reach out for his own support, too. Fatherhood doesn’t happen in a vacuum. He will need men whom he trusts to be his support and to encourage him in his fatherhood. Soon, he might be passing out chocolate cigars when the baby is born! Don’t put pressure on yourself or him to figure everything out at once. First things first. Remember that women are capable and have been having children for thousands of years. Lastly, never forget that you are amazing. Your body has given life to another human being. This is an incredible time, and you deserve to feel confident in your ability to care for yourself and your baby. You can do this—and you are not alone!